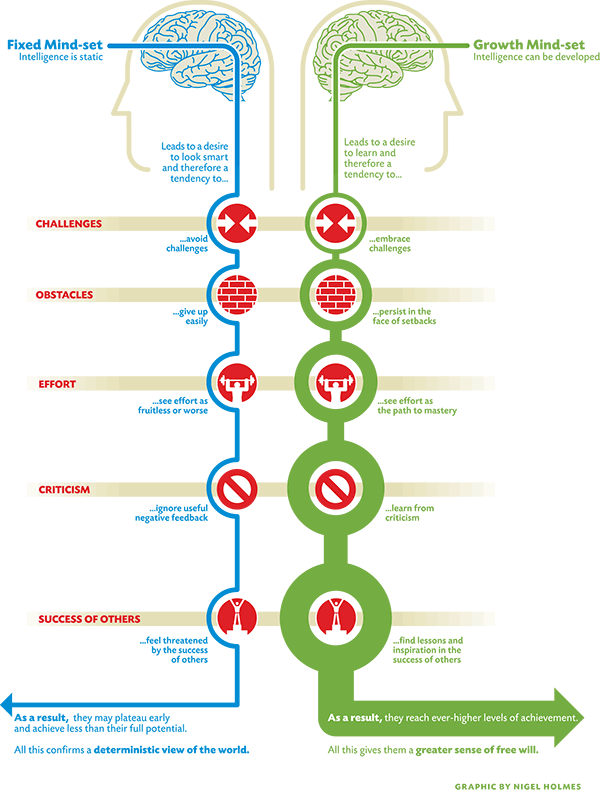 Image from Mindset: The New Psychology of Success by Carol S. Dweck, Ph.D.
Dr. Carol Dweck’s book Mindset: The Psychology of Success defines how success is achieved with more than brains and talent. What determines if someone achieves or fails comes down to choosing either a fixed mindset or a growth mindset. So what does Dr. Dweck’s book have to do with your writing? Everything. If you want to grow and succeed as a writer, it’s time to change your mindset. It takes a lot of work to reach our writing goals. Expect writing to be tricky. Having a growth mindset means taking on challenges and obstacles willingly and openly. Choose to take your writing one step at a time. Do you hate your writing? Keep going. Writers with a growth mindset practice, practice, practice. That means write, write, write, and read, read, read. Don’t dwell on the problem. Writers are problem solvers, so find enjoyment in finding a creative solution. This is tough for us writers, especially when we are very close to the writing. Don’t be defensive. Growth mindset writers listen, evaluate the opinion, and decide if it’s worth applying to your writing. Accept that your writing is a working draft that can be reshaped. Work hard at your writing because you love to write. A growth mindset is about wanting to improve, wanting to learn, and wanting to achieve. Writing is a journey, as is a story, so remind yourself why you love to write. Post your favorite writing quotes in your writing workspace, read your favorite stories, and journal about your favorite writing moments in your life. Only you can choose a growth mindset. Only you can motivate yourself to finish your writing. Only you can want your writing to succeed.